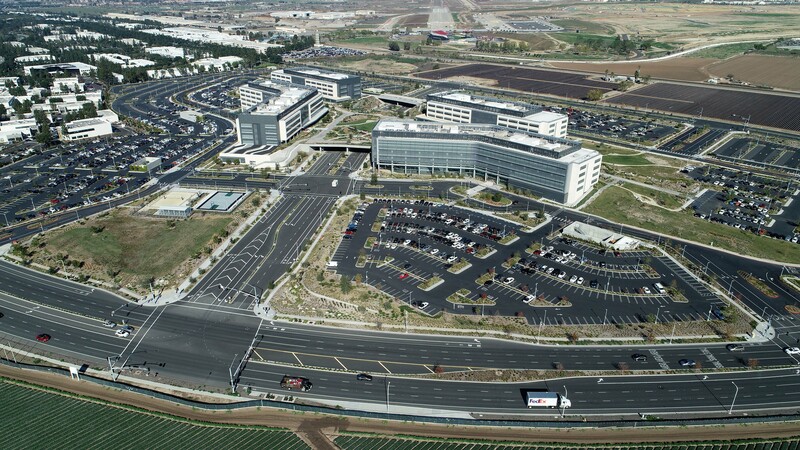 Fuscoe Engineering, as a subconsultant to Gensler, initially prepared land plans and provided due diligence services for two separate sites under assessment by high tech giant Broadcom for its new corporate campus location. Broadcom selected the 72-acre site adjacent to the Orange County Great Park for its corporate campus, which is the largest new office development in Orange County in more than a decade. The Fuscoe team provided comprehensive civil engineering, surveying and stormwater management services for this iconic project. This massive corporate campus is comprised of four office/laboratory buildings and is now known as FivePoint Gateway. The Broadcom Corporate Campus, now FivePoint Gateway is the largest new office development in Orange County in more than a decade. There are two bridges on the property, built to Caltrans standards. One is a vehicle bridge that overpasses Marine Way and the other is a unique pedestrian bridge/tunnel with artwork reliefs at the bridge abutments and variable lighting effects. The pedestrian bridge is topped by a pedestrian plaza, which is mounted with lightweight construction foam to form landscape elements, reducing the soil weight. The landscape is designed to be drought tolerant. All of the parking lots incorporate flow through planters and an LID bioswale feature in the central portion of the campus was carefully integrated into the design. This expansive corporate campus was a collaborative effort which required an immense amount of coordination between all project stakeholders to maintain a tight schedule. To aid in this pursuit, Fuscoe performed 3D modeling of site grading and the elaborate underground utilities, totaling 14+ miles, which were integrated with various other project models. Utility conflicts were identified early to mitigate risk and minimize cost. Three substations were erected to provide electricity for the entire project. Due to the verticality of this project, which includes a raised plaza area spanning over a public roadway, 3D models were an essential tool to maintaining progress on a project of this scale. Broadcom selected the 72-acre site adjacent to the Orange County Great Park for its corporate campus, which is the largest new office development in Orange County in more than a decade. The Fuscoe team provided comprehensive civil engineering, surveying and stormwater management services for this iconic project. This massive corporate campus is comprised of four office/laboratory buildings and is now known as FivePoint Gateway. There are two bridges on the campus, built to Caltrans standards. One is a vehicle bridge that overpasses Marine Way and the other is a unique pedestrian bridge/tunnel with artwork reliefs at the bridge abutments and variable lighting effects. The pedestrian bridge is topped by a pedestrian plaza, which is mounted with lightweight construction foam to form landscape elements, reducing the soil weight.